Elemental Energy is a Booster Pack in the Yu-Gi-Oh! Official Card Game (OCG) and Yu-Gi-Oh! Trading Card Game (TCG). It is the sixth Booster Pack in the OCG Series 4. This set has been printed in the TCG in English, French, German, Italian and Spanish and in the OCG in Japanese, Asian-English and Korean. This set was also released with the Elemental Energy: Special Edition, with one of four variant cards; "Silent Swordsman LV5", "Horus the Black Flame Dragon LV8", "The Creator", or "Sacred Phoenix of Nephthys"
Elemental Energy includes several new "Elemental HERO" monsters, used by Jaden Yuki in the Yu-Gi-Oh! GX anime, along with many cards used by his rival, Chazz Princeton, including the expansion of the "XYZ" monsters into "VWXYZ". It also features "Queen's Knight", "King's Knight" and "Jack's Knight"; long awaited cards from the original Yu-Gi-Oh! anime. Alexis Rhodes cards are also contained such as Cyber Blader. A new set of cards introduced in this set are the "Dark World" monsters, which have powerful effects that activate when they are discarded from the hand, and they are the most anticipated from this set. 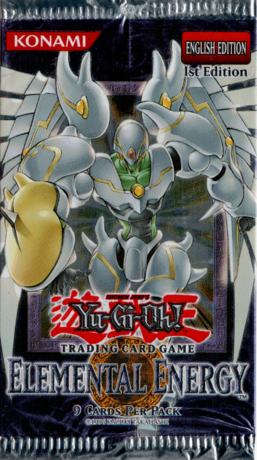 In the OCG the card "Pot of Avarice" was also highly anticipated due to its use in "Gadget" Decks. Highly sought after cards include "Pot of Avarice" and the "Dark World" cards. In the Japanese version of this set, each pack contains 5 cards and each box contains 30 packs. In the TCG and Asian-English versions, each pack contains 9 cards and each box contains 24 packs. This page was last edited on 13 March 2019, at 13:43.